Freshman guard Melo Trimble posted a team-high double-double of 14 points with 10 rebounds to help the Maryland Terrapins claim a close victory over the No. 13 seed Valparaiso Crusaders, 65-62, in the Round of 64 of the NCAA Men’s Basketball Tournament in Cleveland. The No. 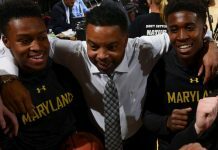 4 seed Terps advanced to face No. 5 seed West Virginia in the Midwest regional semifinals on March 22. Valparaiso (28-6) made Maryland work for the victory, keeping the score tight throughout the game. Maryland (28-6) never led by more than nine points and gave up the lead twice in the first half; they led Valparaiso by just four points at halftime. But, as he’s done all season long, Trimble made big shots and timely plays for the Terps, helping ensure they stayed far enough ahead of the Crusaders to take the win. Nonetheless, Valparaiso had a chance to tie the score at the end of the game when, trailing by three points with 13 seconds left, the Crusaders attempted a game-tying three-point shot. But Maryland senior guard Varun Ram, who didn’t see any playing time until the last 13 seconds, strapped up Valparaiso guard Keith Carter with good defense and forced a turnover to end the game. Maryland senior forward Dez Wells and freshman guard Jared Nickens each scored 14 for the Terps. Freshman forward Alec Peters led Valparaiso with 18 points.